For many years, Allatini’s products are part of every Greek household offering tasteful propositions to every need. Inspired by our timeless values, we consciously choose to advocate Goodness as fundamental basis of a modern and balanced nutrition. Goodness means responsibility and correctness. It further means creating products that offer balanced & delightful experience, using with high quality ingredients. 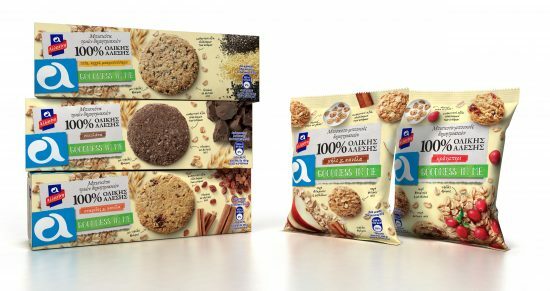 The new ALLATINI “Goodness in Me” line offers a complete source of fiber and, at the same time, it is in portions of less than 200 calories each. • Biscuits’ in three wonderful flavors: chocolate, raisins-cinnamon, chia-millet-nigella. • Biscuit bites, with fruit pieces, vitamins and minerals, in two delightful flavors: cranberry and apple-cinnamon. They are ideal also in milk. Our mission and ultimate goal is spreading Goodness into nutrition, thus we continue to produce ALLATINI products and provide nutritional choices that fulfill every modern consumer nutritional need. Allatini. A world full of Goodness.